North America consumer electronic industry is largely mature and being a technology developed country, it has huge penetration in the majority household in the country. With the advancing technology, the trend of smart offices and smart home is augmenting the demand for consumer electronics products such as smart TV, smart refrigerator, smart air conditioners and more. Post the launch of LG Electronics developed ‘Homechat’, an app that assists users to monitor their home appliances anywhere through their smartphones has further boosted the market. Rising disposable income of the people of consumer electronics and their shift in preferences towards smart homes and smart offices environment, are thus primarily driving the growth of the industry. The increased innovations and interconnectivity among the products has resulted in smarter consumer electronics. Emergence of advanced technologies such as virtual reality, IoT solutions and robotics in manufacturing of consumer electronic products in order to achieve efficiency and low cost has provided significant advantage to North America consumer electronic industry. Moreover, gaming and entertainment applications of the products have further boosted the growth of North America consumer electronic industry. Goldstein Research analyst forecast that the North America consumer electronics industry is set to reach USD 110 billion by 2024, growing at a CAGR of 6.5% over the forecast period (2017-2025). Based on visual and audio products, television segment accounted for largest market share of 53.7% in 2017 and has nearly 55% penetration in North America. Television is closely followed by refrigerators market share, growing at a CAGR of 6.7% over the forecast period. Based on geography, United States accounted for largest market share of 61.4% in 2017 with consumer electronics user penetration of 45.3% in 2017. Canada consumer electronic industry is expected to grow at a CAGR of 6.58% over the forecast period. The report covers the present ground scenario and the future growth prospects of the consumer electronics industry for 2017-2025 along with the industry players’ analysis. We calculated the industry size and revenue share on the basis of revenue generated from major players in the North America region. North America consumer electronics industry is forecasted on the basis of consumer electronics production and supply. 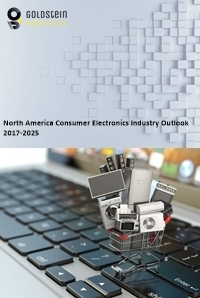 North America Consumer Electronics Industry Outlook 2017-2025, has been prepared based on an in-depth industry analysis from industry experts. The report covers the competitive landscape and current position of major players in the North America consumer electronics industry space. The report also includes porter’s five force model, SWOT analysis, company profiling, business strategies of industry players and their business models. “North America Consumer Electronics Industry Report” also recognizes value chain analysis to understand the cost differentiation, pricing models to provide competitive advantage to the existing and new entry players. Our North America consumer electronics industry report comprises of the following companies as the key players: Samsung, LG Electronics, Sony, Panasonic, Koninklijke Philips N.V., Haier Consumer Electronics Group, Logitech International, Onida Electronics, Toshiba, Videocon, Hitachi, Ltd., Hisense, TCL, etc. The study was conducted using an objective combination of primary and secondary information including inputs from key participants in the industry. The report contains a comprehensive industry and vendor landscape in addition to a SWOT analysis of the key vendors. Click here for market research report sample that will help you get a detailed overview. What is the total industry size by 2025 and what would be the expected growth rate of industry? What are the major barriers to industry growth? Japan Consumer Electronics Market Analysis Report: Industry Overview (Demand, Size, Trends, Share, Challenges & Growth Opportunity) With Forecast 2017-2025.